You like sewing and crafting? 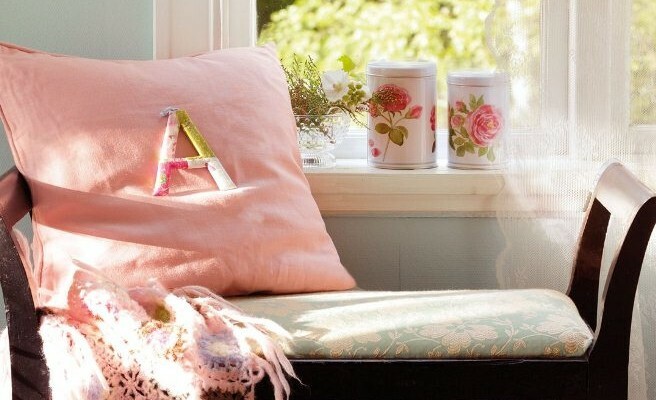 Then you are going to love these DIY home decor ideas! 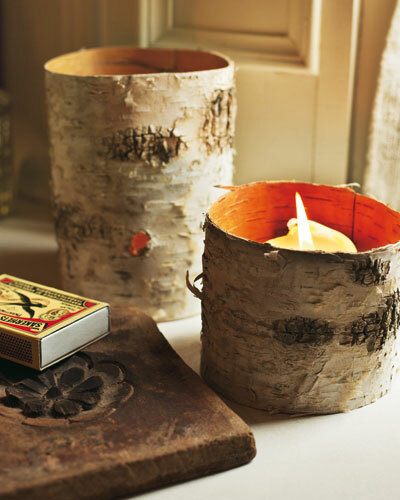 See for yourself how to reuse old home items in a new, unexpected way and use natural materials to create home accessories that complete your modern decor. You’ll for sure come up with a dazzling idea for your own home project. For this chic pendant lamp you just need to remove the fabric from the lampshade, to paint it and decorate with birds and butterflies. The old table lamp gets a new look, too. Remove again the fabric from the lampshade and wind decorative silk ribbons around the metal frame. 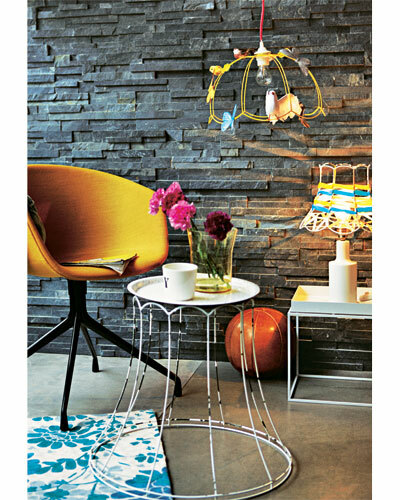 For the stylish side table you need a large lampshade and a round metal tray. Just fix the tray with a hot glue gun on top of the metal frame. 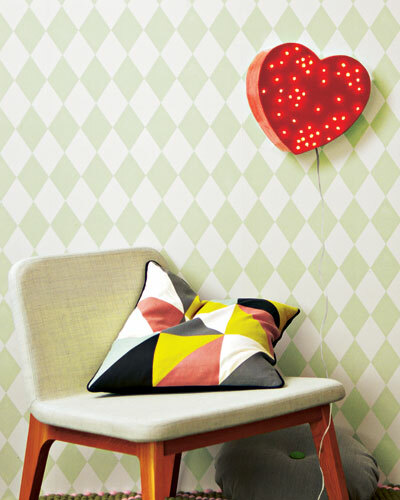 You need a red heart-shaped cardboard box, a self-adhesive picture hook, a string of lights, a skrewdriver, masking tape. Make small holes with a screwdriver in the lid of the box. Drill the holes from the outside to the inside. Then press the small light bulbs from inside the box through the holes so that they stick out slightly. 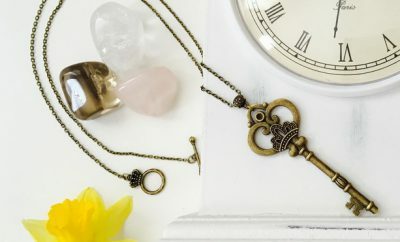 When the lid is closed, the light chain disappears inside the heart-shaped cardboard box. To avoid tangling the lights can be fixed with masking tape if needed. 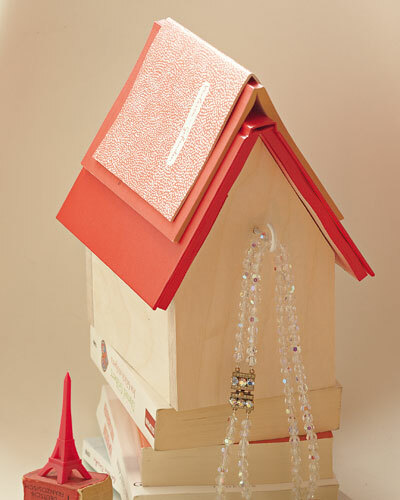 Attach a picture hook to the back of the box and drill a hole on the bottom for the main cable of the chain of lights. Hang the box on the wall near an electric socket! 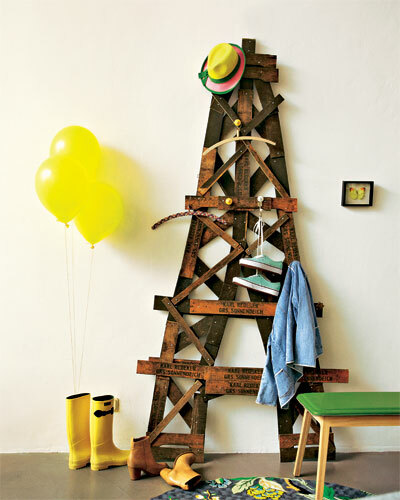 You need 5-6 old wooden crates, screws (3.5 x 16 mm), a cordless screwdriver; decorative hooks and knobs, a photo of the Eiffel Tower, a ruler. Let the apple crates get dismantled by a carpenter. Lay out the wooden slats on the floor forming the backbone of the Eiffel Tower. Use the photo as a template. Screw together the slats with the cordless screwdriver and stabilize the structure with more crossbars on the front and the back at different distances. Some thinner slats are screwed diagonally. Put the tower upright and lean to the wall. Screw hooks or knobs at desired locations to make it a real coat rack. You need scaffold planks, roof batten pieces (lenght = scaffold boards width), tensioning belts and ratchets in different colors and lengths. Get the scaffold boards sewn to the required length by a carpenter (he should also remove the metal frames at every end). 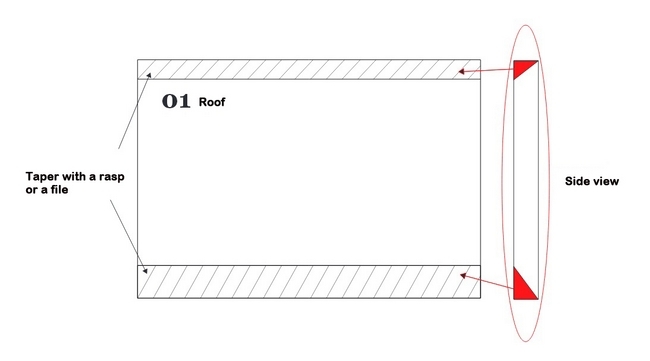 Pick the location and stack the boards over the prepared battens. Coil the belts around and pull them tight. It looks great in a narrow corridor. You need a floating shelf with concealed shelf support brackets, 1-2 rolls of wallpaper depending on the wall area, wallpaper adhensive, a bucket and a brush. 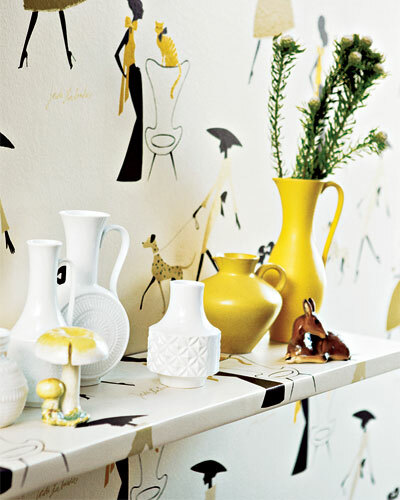 Apply adhensive onto the wallpaper and then directly onto the wall. Wrap the shelf in another piece wallpaper and screw it onto the wall. This way you’ll get an unusual unified look. Get several old vases or bottles, clean and spray them in the desired color. Don’t forget the inner sides of the bottleneck. Let dry and spray at least one more time. 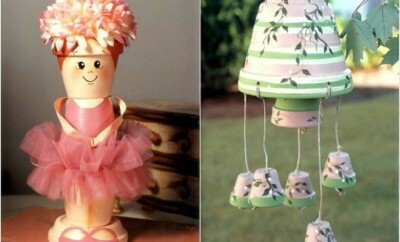 You need lace doilies, Art Potch or Modge Podge glue, small balloons, votive candles. 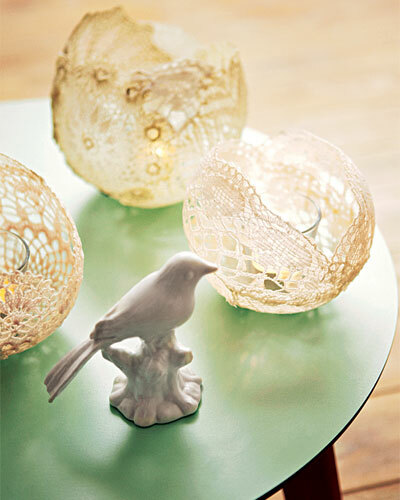 Soak the lace doilies in the glue and place them quickly onto small inflated balloons. They can overlap with at least 5 mm. Allow to dry thoroughly. Pop the balloon and add more glue if needed. Place the votive candle inside. You need coloring pages, several shoe boxes or other small boxes; white emulsion paint, black marker Edding 8400 (0.5-1 mm and 1-2 mm), a ruler, a pencil and eraser, scissors, construction paper in different colors and ribbons.Coat the shoe boxes with emulsion paint. 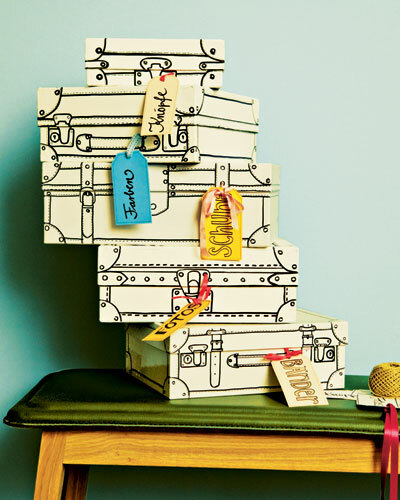 Paint the desired “seams” and “fittings”on the boxes with the help of the printed templates so that these look like small suitcases. You can sketch out the lines with pencil and ruler. Don’t fear of small imperfections, which provide the certain charm! Use a pointed object to make a hole in the handle or buckle and hang the tag made of colored paper. 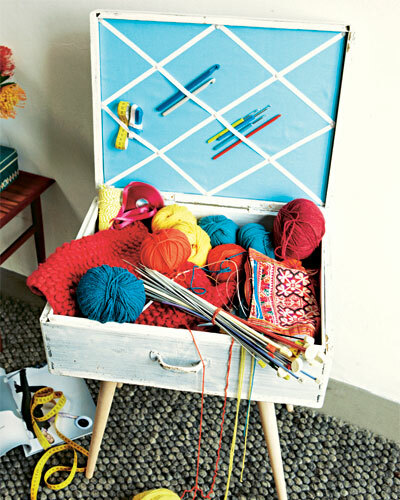 An old wooden suitcase or wooden box, 4 table legs (40 cm long), 4 brackets, a hardboard about 8 mm thick and about 3 mm smaller than the inside of the lid on all sides, 50 cm fabric, upholstery tacks, about 1 cm wide rubber band, acrylic paint, a brush, scissors, a hammer, wood glue, screws and a cordless screwdriver. Paint the wooden case inside and out and let dry. Cut the fabric, so that it’s 8 cm larger than the hardboard and staple on the back. Cut the rubber band into pieces, lay them in a diamond pattern over the hardboard and staple on the back. Fix the rubber band on the crossing points with upholstery tacks. Stick the hardboard in the lid. Screw the legs at approx. 9 cm from the edge and rotate the legs in the thread. 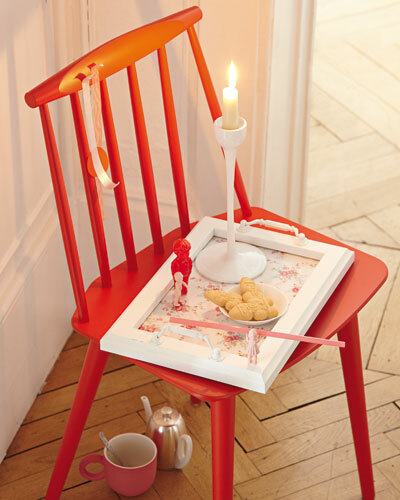 A nice side table with a clever interior! 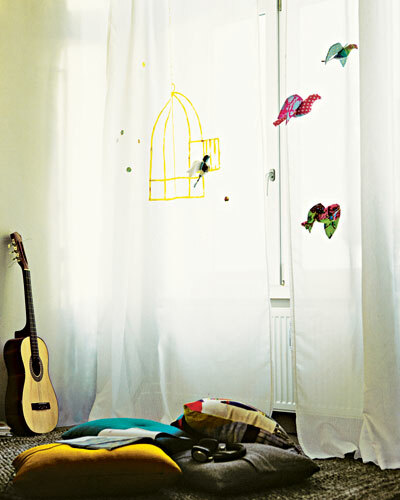 You need an IKEA “Vivan” curtain, a gold textile pen, a black permanent marker, a bird cage template. 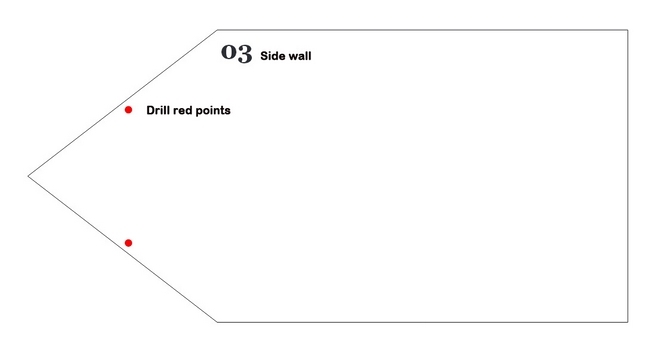 Print out the template, lay the curtain over it and trace the contours with the gold textile pen. You can also sew colorful flying birds to complete the decor. 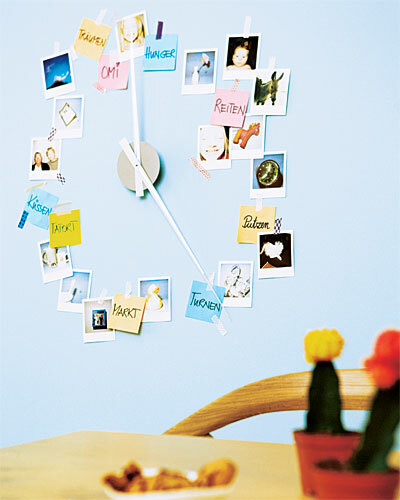 You need clock movement with hands, that can be mounted on a wall, Polaroid photos, sticky notes, washi tape and double-sided adhesive tape. Fix the clock movement on the wall according to the manufacturer’s instructions. Stick the photos in an irregular circle around the clock. Write down some activities from your day routine and add them to the circle. You need a teacup with a saucer, a two-component adhensive, a ring nut, a rope, bird food, lard, a pan. Glue the teacup and the saucer together using the two-component glue and let dry. Now glue the ring nut on the underside of the saucer. Once dried, tie the rope to it. Stick another piece of rope on the bottom of the cup. Heat the lard in a pan, mix with bird seed and fill the cup while holding the rope outside. After the mixture has cooled and thickened, the cup can be hung upside down somewhere in the garden. You need old glass bottles, old beaded bracelets, tape, spray paint and a glue gun. Lay the bottle on a piece of cloth so that it won’t roll away and put the bracelets on the bottles neck. Secure on the back with a tape. Use the hot glue gun and glue on the back, between the two tape strips. Spray together. In 30 minutes you have brand new stylish vases! You need a wood veneer edge (this here is color Ash, 50 m, 24 mm wide), scissors, a staple gun, a cord with bulb socket. Cut 50 to 80 cm long strips of wood veneer edge. Take 3 long strips and staple them together, so that they form a triangle, in which the lamp socket fits. Join the three stripes at each end and staple together. Then put more strips around the form and continue stapling. Use copper-colored staples that match the wood veneer and always staple twice. Finally, screw in the light bulb. You need an embroidery hoop, a spray paint, fabric transfer paper, an iron, computer, printer, fabric, scissors, embroidery thread and needle. Spray paint the hoop and let dry. Print out the photos on the transfer paper and then iron on the fabric. Clamp it in the hoop and embroider with motifs as desired. 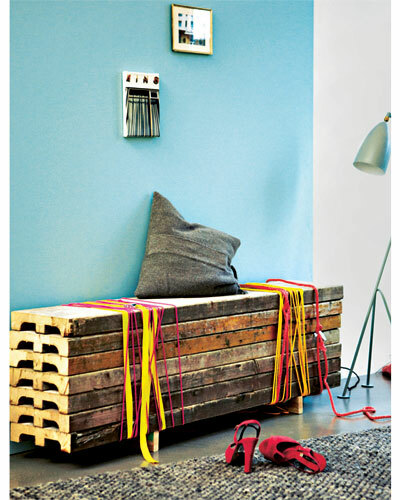 Cut off the excess fabric and hang on the wall. From the beach on the table. 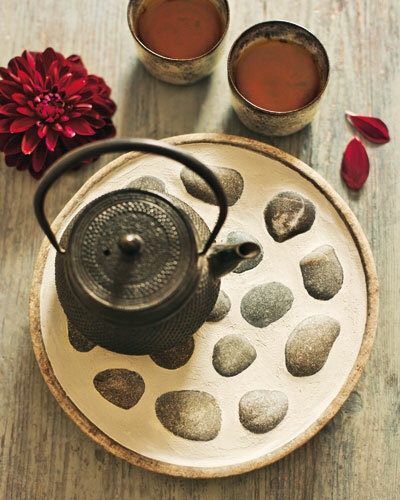 Glue the beach stones with a hot glue gun on an old wooden tray and fill the spaces between with a grout from the hardware store. Let dry for two hours and wipe gently. Cut and bent the birch bark. Then join the ends with the staple gun and place a candle inside. You could also make it even more magical with some holes here and there. You need a picture frame with sturdy back panel, two furniture handles, wood screws, a cordless drill, spray paint, newspaper, disposable gloves and a piece of fabric. Remove the glass from the picture frame. 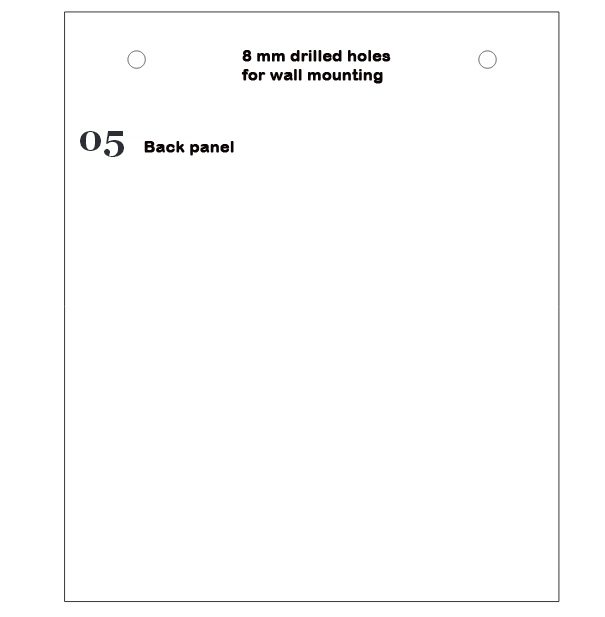 Drill holes with the cordless drill and screw the two furniture handles. Lay newspapers somewhere outside and spray paint the frame with the handles. When the paint is completely dry, lay a piece of fabric on the back panel and put the glass back into the frame. You will need an old hardcover book, wood planks, a wood saw, wood glue, sandpaper, spray paint, newspaper, disposable gloves, a hook, hot glue, pencil, triangle ruler, masking tape. 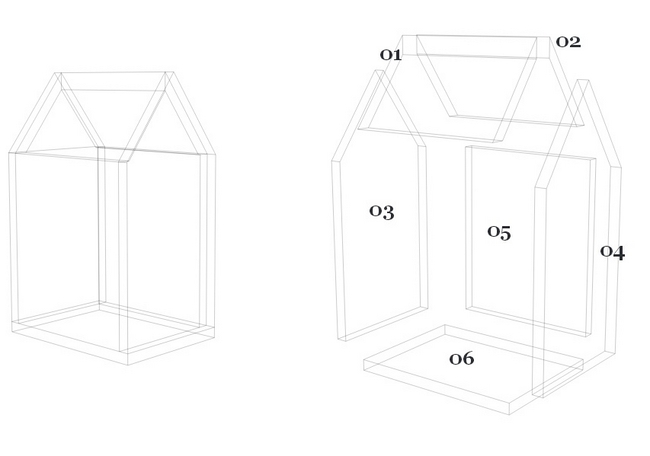 The roof is made of hardcover book, the house walls – from wood. Draw with pencil and ruler a house shape on the wood boards and saw out along the markings.Glue together the wood pieces and sand after drying. Spray paint the “roof” (preferably outside) and wait until the paint dries. Open book in the middle, put it on the house and secure with hot glue. If you screw some hooks on the front side of the house to store your jewelry. 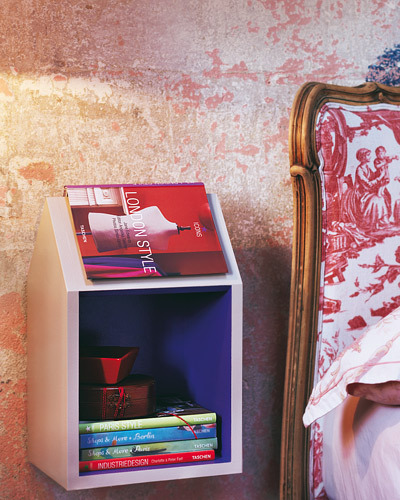 A chic home for favorite books beside your bed.You need: to download the templates and to print them out in the desired size, wood slats (16 mm thick), screws, jigsaw, paint, sandpaper, a brush, a pencil, a tarpaulin, a cordless drill, a file, wood glue. Cut our the template and transfer it to the wood. Saw out the wood pieces. Sand all the edges and taper the shaded areas from the plan with a file. Place the parts of the house together and see if everything fits well. 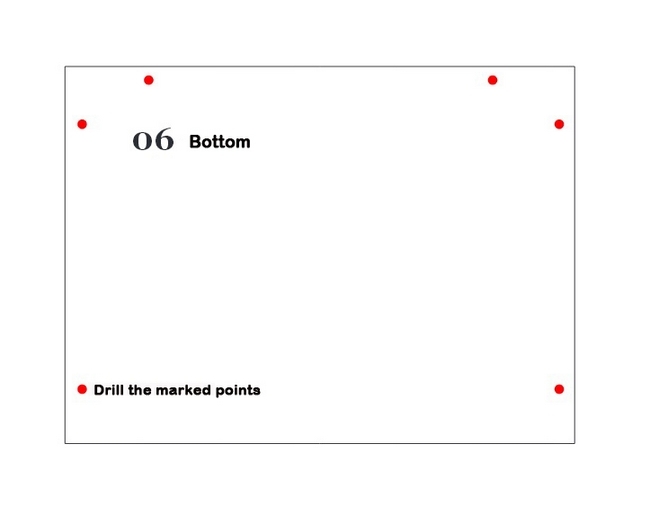 Then drill the red marked points. On the back there are other two holes for the wall hooks. First, glue together the back carefully with the two side walls. After drying glue the construction to the bottom. Then glue together the two roof panels. Finally, the roof is clamped between the side walls. Now screw with the cordless drill through the pre-drilled holes. Screw as deep as possible and then add some fine filler the holes. Finally, paint all walls. After drying, hang the book house on the wall. 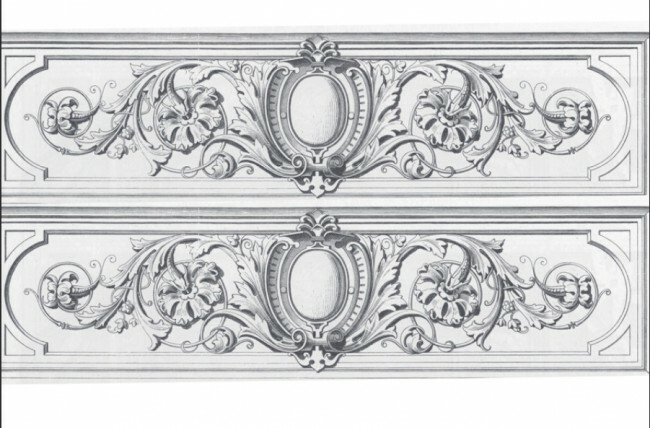 This simple dresser was decorated with lush ornamentation in vintage style. Download the ornaments in antique look or find others that will suit best your style. Print them out on a self-adhesive Inkjet paper. Mark the position of the ornaments with a ruler and a pencil and stick gently the adhesive sheets on the wood. 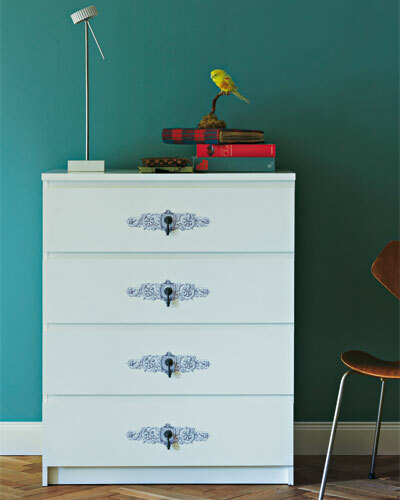 Find matching furniture handles to complete the look.